While I love to do Nia barefoot there are some floors where the toe less socks come in handy. Some floors that I dance on or have danced on have a texture to them that is not very comfortable on the feet. Some floors are really dirty (without access to a dry mop or broom) and so the layer of fabric between the foot and the floor helps to keep the grit from digging into my feet and being uncomfortable. The fact that the toes are exposed give me a bit of a barefoot sensation. Allowing the toes to come in contact with the floor and keeping those nerves activated. The energy flowing from the earth and to the earth via the exposed toes. For yoga these are great because the textured bottom of the sock allows for traction if sliding is an issue for you. The texture also assists in keeping you from spinning on the foot when doing Nia. Ha! I just realized it might help stop that altogether. It is possible to spin, twist, slide on your bare feet although you might end up with blisters. But with the traction on the bottom of the sock it stops you in your tracks. You are unable to spin, twist, or slide. Maybe the yoga socks could act as “training wheels” for some. If at first exercising barefoot seems odd, maybe the socks can help ease you into it. Perhaps the socks could also assist in training people not to spin, twist, or slide, so when they do decide to go barefoot for their Nia workout they will already have the know-how of lifting the feet. 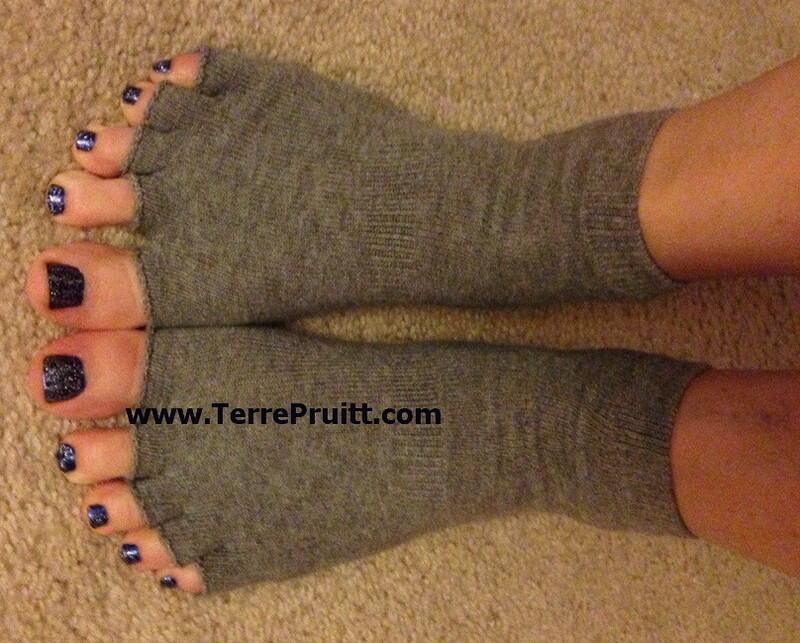 Whatever the person’s reason for not going barefoot, toe less yoga socks might be a great solution. I do want to say, just so you know, when in my Nia classes as long as the facility allows shoes (some yoga/dance studios do not allow shoes), everyone is encouraged to be comfortable so when wearing shoes allow people to be comfortable then they are invited to do so. Do you ever exercise barefoot? Often times in a Nia routine we are stepping or even walking. Since Nia’s movements are based upon the way the body was designed to move a Nia routine is often created with the step to be done with a heel lead. The Heel Lead is one of Nia’s 52 Moves. A lot of different types of dancing is done on the ball of the foot, cha-cha, two step, etc. Some dances are done on the toe as in ballet. With Nia we often are using our heel to lead and not the toe or the ball of the foot. This is a challenge sometimes. Sometimes it seems easier to step onto the ball of the foot or the toe. Using the heel lead technique really allows for our ankles to move through the full range of motion. In addition to allowing the foot to move as it should, stepping on the heel gives the ball of the foot a chance to rest. If it is one’s habit to walk on the ball of the foot it can sometimes become a source of pain. The foot in its very architecture was designed to have the weight (when stepping) borne on the heel not the ball of the foot. While I am leading a Nia class I frequently say, “Heel lead.” And most times it is to remind myself to use my heel. I tend to start dancing on the balls of my feet. A lot of women’s high heeled shoes do not allow for a heel lead. In the case of some of the shoes if the heel were to lead and the weight were to be place on it, it would collapse. I know many, many women who love their high heels for so many reasons. I am not saying that people shouldn’t wear them, but I am saying that we dance Nia in bare feet, the routines are designed to allow the body to move as it was created, so embrace the heel lead. Right now, if you are not wearing shoes that would inhibit the heel lead, try it. As you walk through your day actually consciously, place your heel down (not roughly, just place it down) first then roll through your foot. Notice how your ankle flexes and extends. Practice the heel lead. Enjoy the heel lead.